Beginning each day in the Word and prayer. Have you ever noticed how fair weather and sunny skies lift the attitude among people? Smiles seem more prevalent and people seem to have a more positive outlook. Life is cheerful when the skies are clear, but such days don’t last forever. Eventually, dark clouds appear and sunny dispositions turn gloomy. Certainly, there is a preference for the light and warmth of fair weather. The same can be said for the people of God. As we live in the light of God’s grace, we see the world differently. 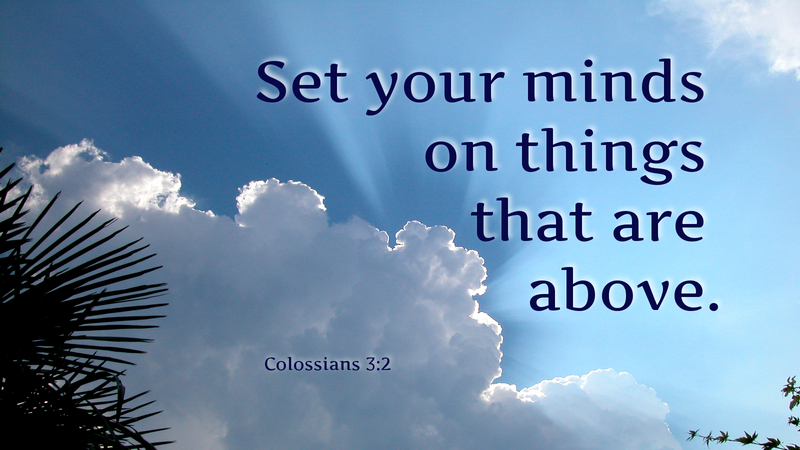 With our minds fixed on God’s love, Christians cannot help but live in the peace and joy of Christ. Yet, sin causes us to focus our attention away from God’s kingdom above. Its darkness casts a shadow over us. For this reason, the apostle Paul reminds the people of God to fix their eyes upon heavenly things seeking the love of God, the compassion of Christ and the communion of the Holy Spirit. The dark clouds and threatening skies of earthly life will come, and bring with them the probability of storms. Still, it is the light of Christ that continues to conquer the darkness. Through him we have life. As we seek the things from above where Christ is seated, we continue to live in the joy of his grace. Heavenly Father, keep me in your Spirit, that I may seek your light and your love. Amen. This entry was posted in Christian Living and tagged Apostle Paul, Discipleship, Following Jesus, Forgiveness, God's Word, Grace, Heaven, Spirituality. Bookmark the permalink.